TeamMate makes life simple: with a range of truly innovative furniture solutions to suit any application. Aesthetically pleasing, modular and practical, TeamMate products are designed to stand the test of time.Teammate products are technical collaboration furniture, presentation trolley, presentation displays, AV Stand, Screen Stand, presentation desk, teaching rooms or training suites and work surface and additional rack space for conference rooms, board rooms, schools, collages, offices and audio video(AV) solution industries. 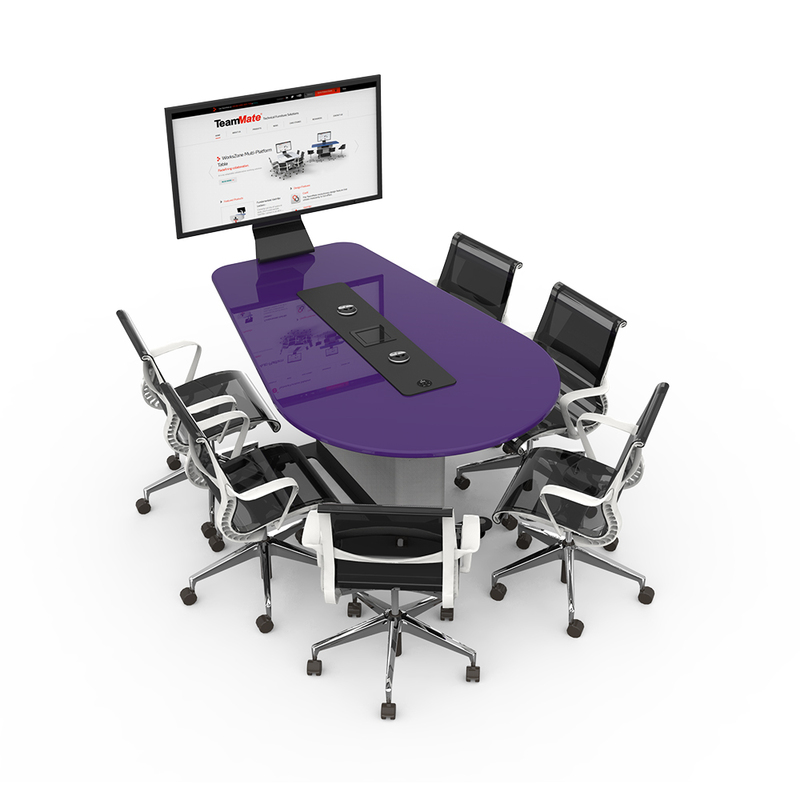 The Teamate Executive is a presentation trolley with a difference. Offering an alternative to a fixed audio isual installation, this mobile solution offers 4 rack size options; ample space to integrate all the audio visual or video conferencing equipment required for a modern business environment and has the stability to support flat panel displays for up to 60” diameter or a maximum weight of 79kg. The Executive is a truly all in one mobile presentation solution available in Dubai, UAE. Designed to support the latest presentation displays and conferencing technologies the TeamMate Presenter screen support trolley is a more versatile alternative to fixed installations. With no need for invasive installations, screens of up to 65” in diagonal are safely supported and with the added mobility of 4 lockdown castors can easily moved between rooms. The Presenter comes with a kidney shaped shelf adequate for a video conference codec or camera and with cable management running through the support column there are no unsightly cables. TeamMate Totem AV Stand – Back to back, is a floor mounted dual screen digital signage solution that supports integrated AV & IT equipment. With a modular construction, the Totem provides options for keyboard stowage or a range of integrated audio-visual equipment, including cut outs for AV control panels, input plate and power outlets. PC storage is provided on the left- and right-hand side of the Totem. Ergonomically designed; the Totem AV Stand- Back to back enables multiple viewing angles of the dual screens and can ideal for creating flexible spaces. TeamMate VariHiteTM Screen Stand is a electrically height adjustable mobile stand for Microsoft Surface HubTM and VESA compatible flat screen displays. With the attention to detail that TeamMate products are renowned for, this multi-functional flat panel display unit is designed to support most large format screens up to 90” and has a maximum lifting weight of 135kg. The ergonomic design of the VariHiteTM Screen Stand allows for use between various spaces, allowing you to collaborate and take the meeting with you. Aesthetically designed with contemporary elegance a Credenza Dual is much more than just a storage cupboard. Using sustainable materials of steel, stainless steel and glass the Credenza lends an architectural feel to any office environment. Each rack is built with a natural ventilation cooling system and cable management for efficient storage of audio visual, video conferencing and IT equipment. Acepaq is dealer, supplier and distributor Manoeuvrable with lock down castors the TeamMate Credenza is a versatile yet contemporary piece of technical office furniture. The Teammate Podium DDA presentation desk, with a width of 2390mm has the most generous usable desk top area in the TeamMate product range. Stylish and contemporary in design, this piece of furniture hasan open access area to accommodate a wheelchair and plenty of integration space for audio visual equipment. The Podium DDA with a modesty panel ready to accept branding is the perfect solution for prestigious lecture theatres or auditoria. The TeamMate Best suited to smaller teaching rooms or training suites, the compact Trainer product is both durable and adaptable. Built around a standard 19in 14U rack with lockable castors, this unit has a sculpted desk top 750mm deep and 900mm wide, space enough for a laptop or presentation notes. Connecting to any display system with ease, the Trainer provides a simple yet professional presentation and teaching solution. TeamMate is Offering a larger work surface and additional rack space the Tutor Dual is the perfect answer for a self-supporting lecturing desk. With a well-balanced design layout, the Tutor Dual has ample rack space able to accommodate all the audio visual technology required for modern lecture theatres and yetis easily mobile on 10 lockdown castors. With a simplistic modern design, this teaching desk is the choice of many leading universities and higher education establishments. Buy technical collaboration AV furniture products in Dubai, UAE, Abu Dhabi, Qatar, Oman, Kuwait, Bahrain, Saudi Arabia and Africa. Our other products and services are Audio Video Solution, Kef speaker, Digibird system, Nec Display, TouchOne system, Hagor system, ScreenLine system, CleverTouch display, Sound Control, PureLink solution and meeting room booking system. Please contact Acepaq Dubai for Quote, Price and Demo. For more information click here.